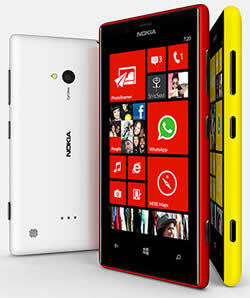 Key Difference: The Nokia Lumia 720 is one of the newest phones that are similar to its flagship Lumia 920. The Lumia 720 comes with 1 GHz dual-core Snapdragon S4 processor with 512 MB RAM and 8 GB internal storage space that is upgradeable to 64 GB. The phone is available with a 6.7 MP primary camera with Carl Zeiss optics, autofocus and LED flash. It also has a 1.3 MP secondary camera with a resolution of 1280 x 960. The Sony Xperia L is a mid-range smartphone. It features a 4.3-inch screen with a resolution of 854x480px and a scratch-resistant cover glass. It runs on Android 4.1 with a Dual-Core 1GHz Qualcomm MSM8230 chipset and 1 GB of RAM. Nokia is a popular Finnish phone company and has been previously known for durability and increased battery life of phones. When it entered the smartphone market, it teamed up with Microsoft Windows for mobile and has been launching phones with their OS. The Nokia Lumia 720 is one of the newest phones that are similar to its flagship Lumia 920. The little brother is quite similar in looks and many features, lacking only the strikingly high price tag. Nokia has recently announced a number of low- to mid-range phones to try and capture the masses. The phone is being touted as one of the best phones for its price range. The phone sports a 4.3-inch IPS LCD capacitive touch screen, with approximately 217 ppi, which is a decent enough screen resolution. The phone comes with the standard Live Tiles format from the Windows 8. The Lumia 720 comes with 1 GHz dual-core Snapdragon S4 processor with 512 MB RAM and 8 GB internal storage space that is upgradeable to 64 GB. It also offers Corning Gorilla Glass 2 for protection purposes. The phone is available with a 6.7 MP primary camera with Carl Zeiss optics, autofocus and LED flash. It also has a 1.3 MP secondary camera with a resolution of 1280 x 960. The company offers many camera features such as touch focus, landscape orientation, auto and manual exposure, auto and manual white balance, still image editor, full screen viewfinder, Cinemagraph lens, Bing vision, Smart Shoot lens and panorama lens. The Smart Shoot lens allows the users to merge two different photos to create a perfect shot, which comes handy, if you don’t like having to tell people pose in front of the camera. The phone is slick and thin bar phone with slightly curved edges. The phone sports a 3.5mm jack on the top, with camera button, volume button and the sleep/wake button on the right hand side. The back also three tiny holes for a Wireless Charging cover, which fits on the back of the device. The phone is customizable with changing shells, making it easier to mix and match the phone with various different colors. The phone has been announced for the Australian market, with launch dates yet to be released for the rest of the world. 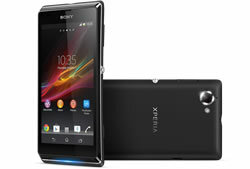 The Sony Xperia L is a mid-range smartphone. It features a 4.3-inch screen with a resolution of 854x480px and a scratch-resistant cover glass. It runs on Android 4.1 with a Dual-Core 1GHz Qualcomm MSM8230 chipset and 1 GB of RAM. It also has all the bells and whistles, including Wi-Fi, Bluetooth and 3G HSPA connectivity, as well as NFC support. The NFC is integrated with a one-touch connection to external displays in order to allow for big screen playback of videos or photos. The phone does not however have LTE capability. Still, its saving grace has to be its 8 MP camera, which uses Sony's latest mobile Exmor RS sensor and offers a built-in HDR mode for both stills and video. The Exmor RS sensor is supposed to improved clarity and color reproduction, while the HDR mode will allow for better pictures in various different kinds of lights. The phone is powered by a 1900mAh battery and has a battery STAMINA Mode for optimizing power consumption. The phone is available in three colors: white, black and red. It also has an LED light on the bottom of the phone that can be customized to blink different colors to indicate an incoming phone call, a missed call or text message. The light can also be programmed to blink in correspondence with the rhythm of the song played on the built in Sony Walkman music player. The phone also comes with pre-installed Sony apps called Walkman, Album, and Movies. These are part of a pre-loaded software suite that allows for consuming and sharing a vast library of multimedia content. The information for the detailed table about the two phones has been taken from the Nokia website, techradar.com, Sony Mobile website and GSMArena.com. 1.3 MP 1280 x 960 pixels camera.